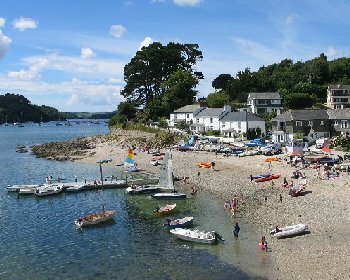 Helford Passage is a small village with a nice sandy beach on the north bank of the Helford River. There is a ferry to Helford village across the river. There is also a sandy beach known as "The Bar" to the west of the village which can be reached via the road. The village car park is about 5 minutes walking from the beach, via the road which slopes downwards and is too steep for wheelchairs. Final access to the beach is level. Helford Passage is about 16 miles from Truro. From east or west take the A390 to Truro and at Truro follow the directions for Falmouth on the A39. Keep on the A39 to Falmouth until the Treliever Roundabout. This is a double roundabout. On the second roundabout take the 2nd left which is the road to Mabe Burnthouse. At Mabe Burnthouse in the village the road bends to the left. Here turn right onto a road signposted to Mawnan Smith. Follow this road for about 3 miles to Mawnan Smith. At Mawnan Smith follow the road through the village and continue on this road for several miles until the road bends to the right and there is a left turning signposted to Helford Passage. Take this road to the Helford Passage car park. 1 car park about 5 minutes walking from the beach. Ferry to Helford, boat hire.